And was it ever raining! 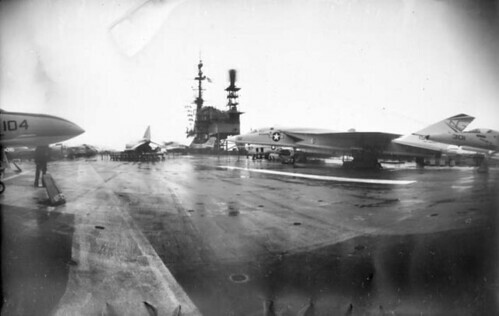 The USS Midway aircraft carrier was commissioned a week after WWII ended, and saw service through the Persian Gulf conflict- a total of 47 years. Also, It was the first ship that was too big to travel through the Panama Canal. It is now permanently docked in San Diego Harbor, and is a museum with more than 70 exhibits within it's interior and top deck. Here we are on the top deck in this image, with vintage aircraft parked and on display. It's a great place for the aviation buffs out there! (see an image from the other side of the carrier, here. This is the last pinhole image of our San Diego trip in January. Perhaps I'll colorize these 2 Midway images, but the desire to do that now is not in me.